There are so many coffee brands out there available in the market that may interest you. But there is none like the long time favorite Folgers and Maxwell House Coffee. If you are interested on tasting these famous coffee brands, go ahead and read our article below. Folgers is a coffee brand originated in the United States and is owned by the famous J.M. Smucker in their food and beverage division. The company continues being the largest-selling ground coffee in the United States since early 1999. Folgers offer a wide range of coffee products. The products that are available in the United State are Classic Roast (Classic “Red Can” and half-caffeine medium roast), Classic Complements (Gourmet Supreme, 100% Colombian, French Roast, Black Silk, and Breakfast Blend), Simply Smooth, Flavored Coffee (Hazelnut, French Vanilla, Chocolate Silk, and Cinnamon), Folgers Gourmet Selections, Instant Coffee, Singles, Home Cafe Pods, Cappuccino, Folgers Flavors Coffee Enhancers, and Folgers Iced Cafe Coffee Drink Concentrates. If you are interested on other coffee brands, read our article on Starbucks Blonde Roast Veranda Vs Willow here. One of the most popular form those products is the 100% Colombian, which available in ground coffee bricks, ground coffee canister and K-Cup Pods. Folgers 100% Colombian is a medium dark roast blend of Arabica and Robusta beans. This variant has dark edge to the flavor and aroma but has no real bite, means the acidity is not as high as its seems to be. This variant said to be popular among espresso fans because of its flavor and aroma. The Folgers 100% Colombian will provide you with a full-bodied coffee without the bitter sweet and smoky flavor of dark roast. From kraftrecipes, Maxwell House Coffee is a brand of coffee originated in the United States and owned by a division with the same name by Kraft Heinz. The brand was introduced back then in the 1892 by wholesale grocer Joel Owsley Cheek and named to honor the Maxwell House Hotel in Nashville, Tennessee. Maxwell House Coffee has been the largest-selling coffee in the United States for many years until late 1980s. Maxwell House Coffee offers various products including ground coffee, Maxwell House Pods, Iced Coffee on the Go, Cafe style Flavors, and Instant Coffee. Maxwell House Coffee is manufactured at their facility in Jacksonville, Florida. The Origin of Maxwell House Coffee is when a man named Joel Cheek met an English coffee broker named Roger Nelly who has an ability of telling the origin of coffee beans only by smelling the green beans, the two then work together to make a perfect blend. This blend then offered to the Maxwell House Hotel, which later purchased the coffee from Cheek. Cheek then partnered up with Maxwell Colbourne Coffee and Manufacturing Company and makes his own blend, which becomes well known. One of the most popular variant of all Maxwell House Coffee is the 100% Colombian ground coffee, which is medium-dark roast. This variant has cloying raw nut and vague spicy wood that dominated the aroma and cup while having some roasted cacao nib and raisin. The Maxwell House Coffee 100% Colombian tastes simple, has bittersweet acidity, a bit syrupy and mouthful. The finish is smooth out with little more cacao and raisin, while less raw nut and wood. Kraft doesn’t specify the type of beans used, but it is mostly a blend of Arabica and Robusta beans. 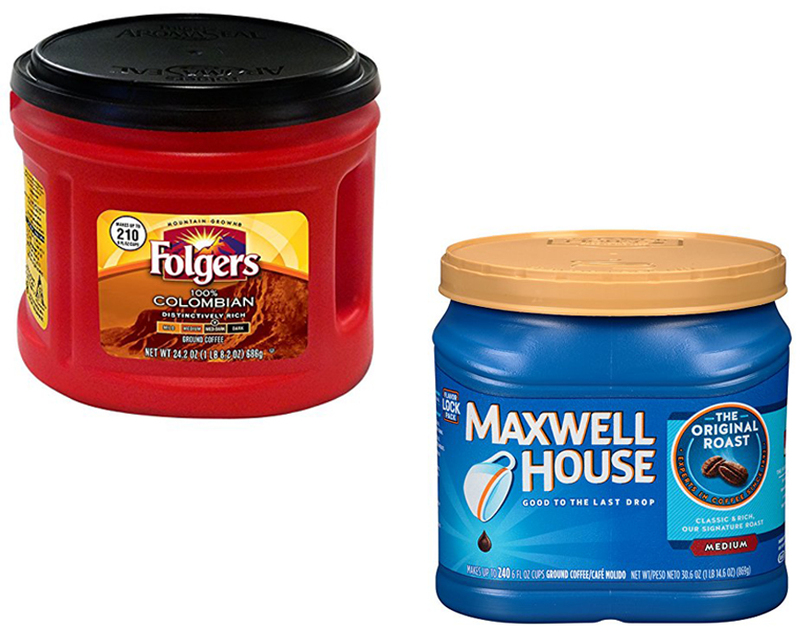 Comparing between Folgers 100% Colombian and Maxwell House Coffee 100% Colombian may be neither as easy nor effective, since each people have different taste and preference. Both of them are the same medium-dark roast Colombian coffee that made from Arabica and Robusta beans, which is full-bodied and have medium acidity. This type tends to have strong aroma but not really in taste. Some may prefer one better than the other, like them both equally and not altogether. However, in our opinion Folgers 100% Colombian have better aroma, taste and aftertaste compared to Maxwell House Coffee 100% Colombian.